When I was a kid, the best part of school was when it ended. That's because I knew when I got home my mom would have an after-school snack waiting for me. The only thing that got me though a day of learning fractions was knowing there was freshly baked banana bread, oatmeal cookies, or chocolate pudding with bananas and graham crackers waiting for me. 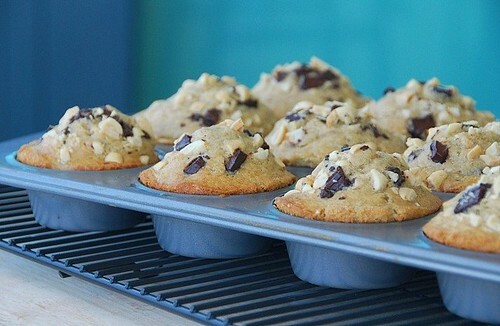 Mom's after-school snacks are the inspiration for today's Crunchy Peanut Butter, Banana, and Chocolate Chunk Muffins. So the next time your child has a test on fractions, surprise her or him with a chocolaty peanut butter muffin and a glass of cold milk. They may just be eternally grateful. What after-school snacks did your Mom make for you? 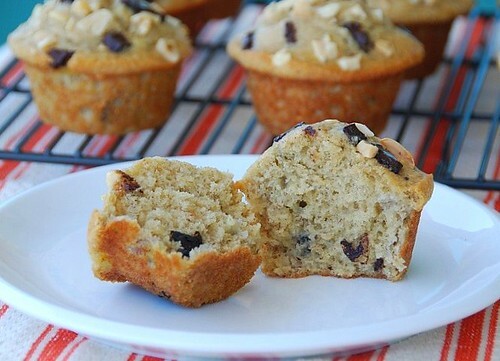 Note: These muffins are meant to be a special treat, not an everyday food. However, if you'd like to reduce the calories and pump up the nutrition, you could replace half of the flour with whole wheat flour, whole milk with low-fat or skim, butter with Smart Balance butter substitute, and 1 egg with 2 egg whites. Place rack in center of oven, and preheat to 375 degrees F. Spray a 12 mold regular size muffin pan with cooking spray. Combine flour, sugars, baking powder, baking soda, salt, and cinnamon in a large bowl and stir well. In a separate bowl, combine milk, butter, and eggs and lightly beat with an electric mixer. Add the bananas and peanut butter and lightly beat (it's okay if it's a little bumpy). Add to the flour mixture, mixing until just combined. Avoid over mixing the batter as it will become leaden. Using a rubber spatula, fold in the chocolate chunks. Spoon the batter evenly into the into 12 muffin cups. Sprinkle each muffin with some chopped peanuts and chocolate. Bake for 18-20 minutes, or until the tops are golden and a cake tester inserted into the center of a muffin comes out clean. Transfer the pan to a rack to cool for 5 minutes before removing each muffin and placing on a wire rack to cool. **You could substitute semi-sweet baking chocolate for the dark chocolate if you prefer. 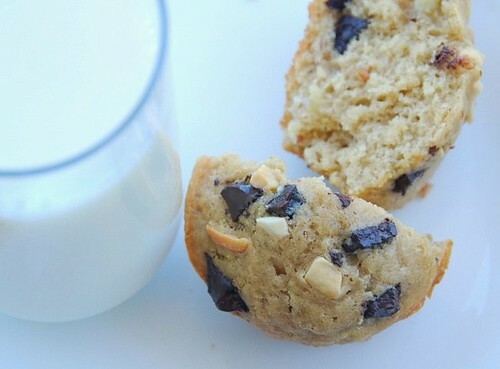 Fresh baked cookies and milk was always a favorite snack of mine and it still is! What a muffin! My mom was the queen of the smoothies and would usually have one waiting for us in the car when she picked us up. My mom used to make snacks everyday for us when we came back from school, but then they were the traditional snacks. Now i do the same for y daughter too. And everytuseday she brings one or two of her best friends and they all enjoy, so i make something special on tuesdays and this is something i am going to bookmark and make for them as they look so yumm and perfect. oh..this looks delicious! My mom made me chocolate rice pudding as an after-school snack! By the way, Susan - look at those pointy muffin tops! You're a pro now! Aaahh, those wonderful memories! I loved coming back home and eating the after-school snack my mother prepared... What gorgeous muffins! My was not really a baker but we had fruit, veggies and cheese & crackers for snacks. PS I have left something for you over at my blog. You can cherish it close to your heart or pass it along whichever you choose...just know that you are apprecaited. p/s: thanks for the mention! I'm ready to be adopted by your mom! My mother used to give us fruit, and more fruit, for snack time. She'd never keep cookies or anything like that in the house, for fear she'd eat them all -- and I am the same way! Amazing looking muffins! I can't wait to try them. I only remember eating fruit when I got home from school! Awww see, us latchkey kids didn't get awesome afterschool snacks! bummer! my mom was never one to have junk food in the house and I remember one time raiding her gingersnaps (which were for cooking...i forget what) and eating the whole box. She came home from work and was like, boy you were hungry! Yum. what a nice treat. Mmmm...peanut butter and chocolate. Def a great indulgence! My after school snack was a mortadella sandwich! I was a latch key kid...lol - and I was a young foodie - I made my own snacks...but I'd have loved to have this as a snack! ... an enjoyed with a cup of fair trade coffee... perfect! Even if my mom had made snacks for me, I wouldn't be able to think about anything but your muffins. Holy hannah!! They look divine! Those look simply beautiful! Looking back, I don't remember any particular snack, but I do remember getting together with the neighborhood kids to compare the snacks available at each of our homes then all of us heading to that kitchen. Tee-hee! yummm! those look delish. pb and banana is the best. plus chocolate?! amazing! my mom always halved apples and covered them with cheddar cheese and baked them until melty. it was my favorite snack ever. i still make it allll the time! Yum - what a great mom you had! I'm sure that my mom made great after school snacks, but what I remember the most was graham crackers with frosting. So, of all the things she made, I would say those snacks were the most memorable! I don't remember any after school snacks quite like that! I think I would have a turkey sandwich most of the time! I know my oldest would be thrilled if I made these for him... so, these are going to the top of my pile of recipes to try! I don't think there's a better combo in the world than chocolate and peanut butter! My mom didn't bake much for us - and went back to school in her 40s - but she did and still does make a mean pound cake! These look fab-u-lous! I love these. 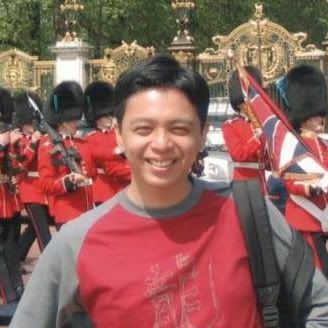 :) Thanks for the link....and the totally sweet words on my blog. I feel the same way and totally wish weren't across the country! Wow... what a lucky kid you were! We didn't get an "after school snack" as kids growing up, since we didn't get home until 6. Dinner time was our snack! These look fabulous though! I've saved them to make soon! My kids would love these. Mom is the breadwinner so we didn't have snacks waiting for us :) Fixed ourselves condensed milk or peanut butter sandwiches. I wish I'd known how to cook/bake back then, I would've been so lucky to have had these muffins! This post couldn't have come at a better time! I have a bunch of bananas that are starting to brown and I've been wanting to make something besides banana bread with them. These sound so good! I've been wanting to make peanut butter muffins for sooooooo long. I really must just do it soon. These look so yummy! I love your photos. The snack my mom baked a lot was banana bread. Oh and also, damn those muffin tops are perfect!! My muffins are rarely (or maybe never) so perfectly shaped! lovely muffins. my mum often made pancakes or crepes with diverse fillings. we also often got savory indian snacks like pakodas with a spicy dip. these muffins look great and i am sure they will put a smile on soerens's face! thanks susan! That's the kind of mom I want to be!! I don't remember getting after school snacks, but I could be wrong. These muffins look great! My mother was one of those "always on a diet" mothers that never had anything good to eat in the house. If I was really hungry I might tear into one of those foil bags of Weight Watchers dehydrated "apple snacks" that had a weird pink colour and fake strawberry scent to make it more exotic (I guess). What memories :) Your muffins look delicious! My after school snack was usually a parfait made of apple sauce, vanilla yogurt and granola. I still love it. I remember after school snacks! Definitely one of the highlights of the day, usually to be followed by video games or something equally productive, lol. Those muffins sound delicious (and I love the lead photo)...I also had muffins...and cookies, ice cream, pastries...after-school-snack time was really dessert time. These look so much better than what I just baked. My kids have some friends over & I'm playing "nice mom" today which means fresh-baked goodies. I bet if I had made this instead, then these kids would have worshiped me! I'll have to try theese soon. cwannabe-Ooh, that's a light and healthy treat. I love smoothies. happycook-That is so sweet of you. I know you're making happy memories for those children. veron-Mmm... who doesn't love that? kalyn-Homemade cinnamon rolls? Oh, how I love those. rosa-It was always a special time. val-Thank you so much! You just made me smile. lydia-We had lots of fruit too, but baked snacks were the best. michelle-Aw, now I feel bad. I love gingersnaps though! peter-mortadella sandwich? Now that's a snack! cynthia-I'm glad you had those special days too. darius-That's great that you took such good care of yourself. louise-That was a good strategy! heather-Ooh, that sounds really good. kristen-My mom never made those. I wonder if they were a regional treat. happyhomebaker-You're welcome! And thank you. abby-Wow, I can't remember the last time I had a pound cake. And they're so good. chris-6? Oh, that's late. Hope you had dessert! mark-That's great that you were so self-sufficient. And hats off to your mom. eatmedelicious-Thanks so much! Oh, banana bread is one of my favorites. meeta-Pancakes or crepes sound lovely to me. I hope Soeren likes them! deborah-You're going to be a wonderful mom. goody-I think you need to go bake some muffins too. :) Thanks for dropping by! mike-I was a Pac-Man addict! Those look delicious - but now you have me wondering if we had after school snacks or not - I just remember wanting cakes warm out of the oven and my mum wanting to let them cook and be iced - am sure these muffins would be wonderful warm! Our snacks tended to be savoury - grated cheese and chopped salami mixed with mayo and popped under the grill. Yum.